Simple Marketing Blog: What Makes for Digital Marketing Success? What Makes for Digital Marketing Success? This is the first year since 2006 that Bathroom Blogfest didn't take place for a number of reasons, not least of which had to do with life happening (see 7 Customer Experience Insights from Charity: Water). 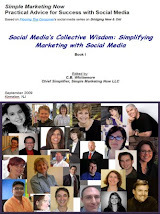 That said, I enjoyed re-reading 7 Digital Marketing Musings after Bathroom Blogfest 2012 and being reminded how valuable an opportunity it has been to experiment and collaborate on this project. Which, ultimately, is what is at the heart of digitally infused social interactions. Let me know what you've learned as a result of your digital marketing experiments. What made them successful?